Gift Certificates are the perfect solution when you just can't find the right gift or you are short of time. Lior Daniel Gift Certificates make the perfect present for friends, family and business associates. If you are unable to decide what to buy or simply do not know their size or favorite color, you'll find our Gift Certificates ideal. 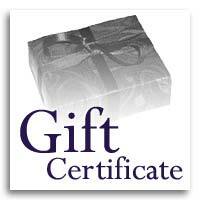 We can only process one Gift Certificate at a time and we must process it seperately from the rest of your order. There is no transaction fee and, of course, no shipping fee for this purchase. No sales tax is charged when purchasing Gift Certificates; however, purchases paid for with the Gift Certificates will be charged the applicable sales tax and shipping charges.